The other day my co-worker was on her way to donate a bunch of unused items she had found in her mom's basement. Of course I requested to see it all before hand. You just never know what kind of treasures you can find, right? Well, here is one of them. This old suitcase has a charm all its own. 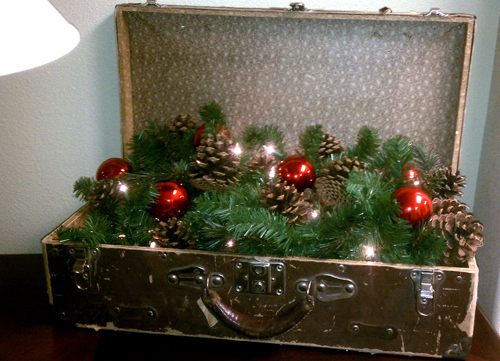 I simply threw some greenery in it, along with lights and pine cones and some left-over red bulbs to dress it up for the holidays. It looks just darling sitting in our entry at the office.